The race heads away from the mountains for the Rhone valley but takes a winding route over several small climbs. If the race took a straight line it would head over the awkward Vercors mountains, instead it avoids such testing roads but still, this is an awkward stage for riders and teams alike, none more than Luke Durbridge and Orica-Greenedge. French TV commentators learned a new word yesterday… or at least how to pronounce “Luke”, as in Durbridge. In the early afternoon it was “Lookay” Durbridge but the Australian won the day and French TV fixed things. Odd, since almost everyone in France knows how to pronounce the name “Luke” given the popular comic books called Lucky Luke. Besides it’s just like the French name “Luc”, as in Luc Leblanc, the 1994 World Champion. Was Luke lucky yesterday? Perhaps, the weather helped him set a fast time and he paid tribute to Mother Nature saying “I was lucky with the wind and the rain… …Sometimes you just need some luck” but others enjoyed similar conditions and didn’t go faster. The faster Durbridge goes, the luckier he gets. Today’s stage should be a sprint finish but it’s not a nailed-on certainty. Any feeling of frustration from Wiggins at being beaten just by one second will be met with relief by his team mates today. Orica-Greenedge now have a jersey to defend and they’ll try to contain any breakaways during the day. The Australian team don’t have high hopes for the overall so keeping the yellow jersey for as long as possible will be the aim, even if they have riders capable of poaching stages. Meanwhile Team Sky don’t have to work all day. There are few sprinters in the race so many teams – especially the French ones – will be keen to send men up the road in the hope they’re not reeled in. Expect a flurry of attacks and several teams to place riders in a breakaway. But several teams might fancy a sprint, for example Argos Oil – Shimano with John Degenkolb and FDJ – BigMat want to set up Nacer Bouhanni. Plus Edvald Boasson-Hagen can have a go, even if most of Sky are working to protect Wiggins. However there are several obstacles for the sprinters. 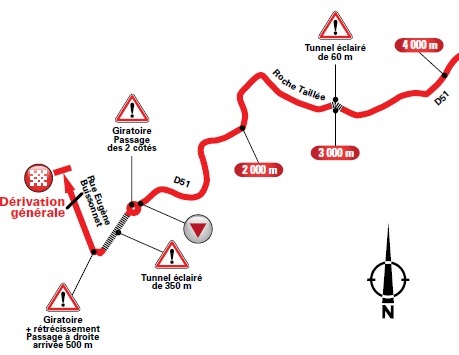 The last climb is the Côte de la Sizeranne, 9km from the finish. It’s listed as 6.6% for 2.9km, enough to give the sprinters trouble. I’ve looked and it seems more like 6.9% for 2.6km and steeper than the average suggests, kicking up at 7-8% for the first kilometre, then a tiny dip, before rising up again at more than 7%. This is enough to thin the bunch and those fighting for the stage or the overall will need to be at the front. This time last year people would have been tipping Philippe Gilbert and watch for others like Thomas Voeckler or Alexandr Vinokourov. The last kilometre is flat but worthy of the Giro. One roundabout then a 350 metre tunnel and then a roundabout with a narrowing road and a right turn just 500 metres from the finish line should make it lively. Weather: cold conditions at the start but the more the race heads west, the warmer and sunnier it will get. A light breeze from the north, temperatures will be a cool 17°C (64°F). TV: the finish is expected between 4.00pm and 4.30pm Euro time but tune in at least half an hour before to watch the final climb plus to see if a breakaway can make it. Eat: the finish area is big area for fruit production where peaches, nectarines, apricots grow in large orchards. This being France they are often quickly transformed into jam and cakes. Wild pick: Julien Simon of Saur-Sojasun. The double stage winner in the Tour of Catalonia has a fast finish and should be able to clear the the final hill. This, Tilford’s blog, and CyclingNews app are my usual online stops on pro cycling commentary. Another good write-up, thanks. I’m just curious if your day job involves cycling? Thanks for a great post (again). This is consistently the best blog site. My tuppence – I wonder if a couple of riders who have a bit of punch for that last climb who are also well placed from the prologue might fancy trying to steal that yellow jersey? I’m thinking Barredo or Chavanel. Rabobank could actually launch a few attacks with Barredo and/or Martens, with Michael Matthews giving it a dig in the sprint if it all comes back together – Matthews looked pretty strong in the prologue yesterday. Yes, Matthews is a good pick today, I should have listed him above (but then I’d be accused of listing half the race!). His time was good yesterday too. Trying to focus on Dauphine, but somehow TDF has started playing with my mind and a scenario: Cadel withdraws after ten days of racing due to knee injury (having forced the build up to repeat 2011 win), Wiggens suffers from crash on wet roads (could actually happen again) and suddenly Andy Schleck finds him self within reach of a “second” win – with Johan Bruyneel smiling in the team car. Who calls the shots? Fränk or Johan! Or Kim Andersen via text messages! It is not that I do not like Dauphine but come July come fun. Sorry, back to work. I think Riis has struggled to call the shots in the past. In 2010 he told Andy Schleck to attack on the climb to Avoriaz with 7km to go. (A reminder: it was the first mountain stage, when Armstrong crashed) But Andy Schleck refused saying there would be more time to attack. Given this you can imagine the Schlecks doing what they want. Bruyneel might have to copy Cyrille Guimard who I think had to use his team car as a weapon and threaten to run Lucien Van Impe off the road in order to make the Belgian attack. Van Impe got the message, attacked and ultimately won the Tour de France. So true. And what if Andy really is Fränk and Fränk is Andy, just like Edward Norton in Primal Fear where Aaron Stampler under considerable pressure from Martin Vail (Richard Gere) turned into “Roy”. Inrng, just responding to the perception of the “Schlecks doing what they want”. Setting my disrespect of Bruyneel’s media tactics aside for a moment, is it even an option for him to leave Andy Schleck off the TdF team? If you have 3 Tours left on contract to work with an individual, why continue to enable the behaviour? Let the team know (behind closed doors and not in the media) what performance indicators you are expecting of them and then reward performance (or positive trending performance) with a spot on the team. Action speaks louder than words. @Kat: I agree with Bruyneel letting RNT riders know what his performance expectations are within the privacy of the team (and rewarding performance with a roster pick). Where the Schlecks are concerned, using the media has backfired and only made things far worse than they already were. For Johan, he has mainly Cancellara’s two March wins (Strade Bianche and Tirreno-Adriatico, St. 7) and Fuglsang winning in Luxembourg yesterday (plus Gallopin’s Young Rider Classification in Oman). Cancellara’s just coming back from injury and Fuglsang could be a solid choice for GC for the Tour. There aren’t enough wins this season to reward. I surmise that the reason RNT has had a poor season has to do with its management. Look at the impressive team roster. With all the past successes of its riders (aside from injuries), why on Earth would so many be having a lackluster season all at once? Low team morale is my guess. Bruyneel’s sports psychology implementation on the Schlecks hasn’t worked, but nothing else has worked on most of the team either. Kinda late in the game for Johan to pull tricks out of a hat. This season is sunk for them. Yes, he went for it with Coppel and Kasheckin. It’ll do Evans a lot of good, the confidence will come and the stature on the team grows. It might take the threats of running lil’ Andy off the road – he looked pretty pathetic on today’s stage. BRAVO to Evans, attacking on the DESCENT! Everyone will say if their fave’s doing well here it’s a sure indication of their wonderful results come July while the ones with faves not-so-good will say there’s still time. All one can believe is JULY is the beeg shew and nothing here (other than crashes or injuries) really has much bearing on LeTour…that’s why they have the race after all. I seem to remember Evans attacking on the descet to Pinerolo in the TdF last year. Cuddles can handle a bike, that’s for sure. Cadel’s downhill attack was into Gap if I remember correctly (the stage before the Pinerolo stage). His move today reminded me of that day as well though – he’s certainly got nerves of steel to attack downhill! I guess his mountain biking days are still with him, when the gap between the trees is the width of a road it probably seems a doddle in comparison to a single track! I was intrigued by Wiggins’s comment in his post race interview that he hoped to lose the yellow by the time trial so he could wear his Sky skin suit. I’m sure plenty of snide people on twitter (I’m looking at you UCI overlord and Festina girl) will take offence at his dishonouring of the yellow jersey etc but if I was going to do a 53.5km TT I’d probably want to do it in the clothes I was used to as well (not to mention the inevitable go faster secret squirrel features it probably has knowing sky). My question is, for anyone that’s in the know: can Sky get addidas to whip up a yellow skin suit for such situations or do riders have to wear the skin suit/jersey provided? Obviously for sponsorship reasons it would have to be branded as ‘le coq sportif’ and devoid of addidas stripes etc, but could it be done? I dunno about the Dauphine, but I’d sure expect to have a yellow version of my regular skinsuit for a time trial in the TDF. It probably only makes a few seconds difference, even over a long TT, but with more and more grand tours being won and lost by narrow margins it would be unfair to the leading rider if they were to lose time by being forced to use inferior equipment. Luke may have been lucky with weather conditions, but his performance was not luck. He is a candidate for most talented espoir in the world, in a first-rate class of candidates for that distinction. His name has been tossed around by talent scouts and those who track up-and-coming juniors for some time. well well what can i say cadel won the 1st stage and wiggins in yellow by a second. this race will be interesting,but what a shocker to see andy lost 3mins today on a cat three climb,johan will be more furious now. old boy vino too lost time i hope he will get some form soon. Have you considered the possibility that RST are sandbagging? I certainly wouldn’t put it past Bruyneel to play a very long con with Schleck’s performance. And there’s been so many quotes fed to the press, it could be said that the lady protests too much. Dangerous game though, if it doesn’t pay off with a winning blindside in the mountains or unexpectedly strong ITT performance then it’s just noise. Indeed, it wouldn’t be the first ‘miracle’ for Johan. This will indeed do Cadel’s confidence a lot of good. It’s too early to be going from performance, but with fragile people like Cadel their mental state counts for a lot more. I suspect this race will be a mindgame between him and Wiggins with a lot of riding next to each other and looking deeply into each other’s eyes, testing the waters. As far as the Sclecks go, it’s sad to see them like this. Bruyneel seems to be stuck in the dark ages as far as rider management goes. Motivating Armstrong would probably be the easiest job in the world, so he probably needs some experience. Hire a sports psychologist in order to get the best from your riders, or just quit. If I was DS, they would all be riding for Fabian. Who cares if they don’t podium overall, Fabian is handsome and world cycling loves him. I don’t think Evans is ‘fragile,’ certainly not on the road; if he was fragile and a ‘confidence’ rider, he certainly wouldn’t have backed himself and pulled the other GC contenders Contador, Sanchez, Basso, Voeckler and Frank Schleck up the last 25kms of the Galibier in pursuit of Andy Schleck last year. If that stage didn’t solidify his mental fortitude, I don’t know what would! Andy’s Tour prospect is worrying. This is almost mid June and he still couldn’t find his form. Though, as we know the brothers get better as the race develops. Hopefully he could become a worthy contender like the pass few years. At this rate though, I wouldn’t hold my breathe. Seems like Johan is doing a little back-pedalling.